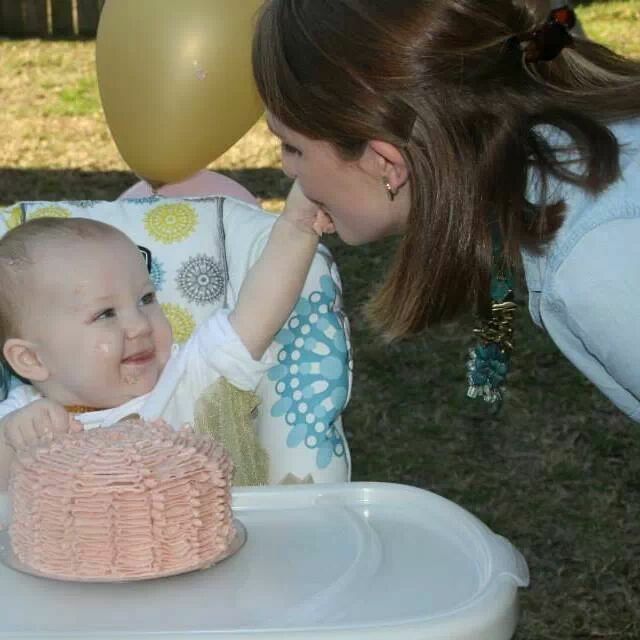 Ainsley had her first birthday party a couple of weeks ago. I started thinking about it and gathering ideas for her party months in advance. One of the biggest things I was unsure if I would be able to pull off, was her cake. I knew I wanted it to be gluten free, at the very least. We are keeping her gluten free for at least two years. The more I read though, the more ingredients I decided were unnecessary for her first cake. So her cake ended up being free of refined sugars, grains, gluten and food coloring. It started out dairy free as well but I added creamed grassfed butter to the frosting. Ainsley never made it past the frosting. She still is not really into eating solids, so there wasn’t a whole lot of smashing going on. Hunter and I tried the cake with the frosting and we both thought it all tasted great. Below are the recipes I used and the modifications I made. It was really easy and I definitely think it was worth the effort. I made the cake friday, wrapped the layers in saran wrap and put them in the fridge. My sister and I decorated it Saturday afternoon and then put it back in the fridge overnight. Her party was on Sunday. I took the cake out when the party started so that it had a little time to soften before she ate it. The cake: For the cake I used The Urban Poser’s smash cake recipe. I could not find a 4 inch cake pan so I made the recipe twice using a 6 inch pan. So where the recipe makes two four inch layers, it only made one layer using the 6″ pan. So I made the recipe, cooked one layer, then did it all over again. Also, I had to increase the cooking time to 35 mins because of the bigger layer. I definitely suggest getting two 4″ pans. Save money on ingredients, plus time. The only thing I changed to the ingredients was I used maple syrup instead of honey. This is a good option if you are concerned about giving honey to your baby right at one year old. I did one layer with honey but ran out. So the next layer I just used pure grade b maple syrup. I actually liked the flavor of the syrup layer more. For the filling: In between the layers I used the 365 brand raspberry spread , found at Whole Foods. It was the only one I saw that did not have added sugar. The Frosting: I found I could not get the coconut butter smooth enough when using The Urban Poser‘s frosting recipe that she has with the cake. It tasted amazing but the coconut butter would clog the tip I was using to pipe on the cake. So I turned to Against all Grain. I doubled her vanilla frosting recipe that is in her cookbook. I don’t see the recipe on her website but trust me, the cookbook is worth buying! I did add about 3-4 tbsp of butter to the frosting. I needed the frosting to be thicker for the way I wanted it decorated. I put the butter in a bowl, beat it with the hand mixer and then added it to the frosting. You could probably use palm shortening and get the same results. And lastly, my sister and I watched videos on youtube on how to decorate a ruffle cake with buttercream. I made the cake twice. Once for her birthday pictures (without coloring the frosting) and then again for her party. Sharing with me at her party.